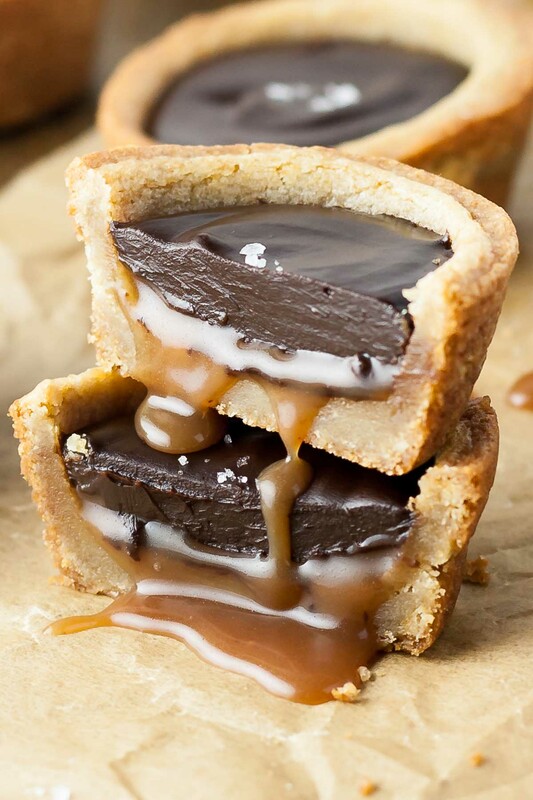 Chewy caramel cookie cups loaded with gooey caramel and topped with a silky dark chocolate ganache. Gooey is an understatement. 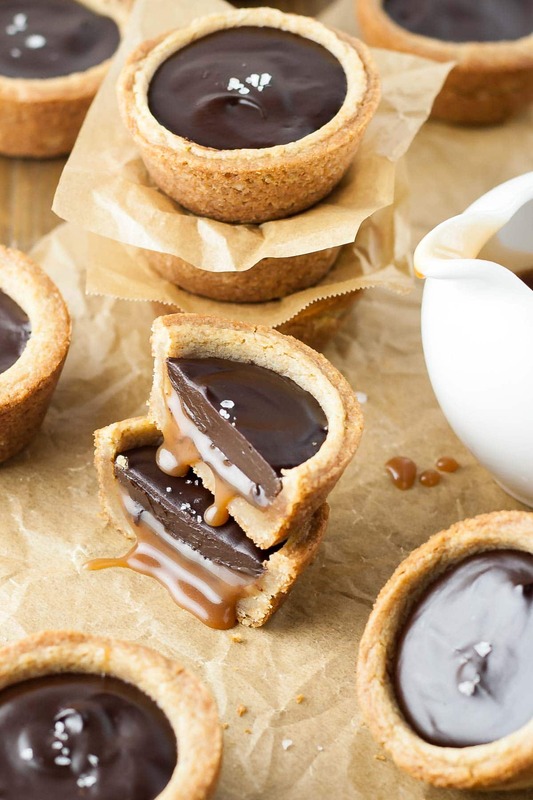 You’re going to need a napkin nearby when eating one of these Caramel Cookie Cups, but I’m guessing you’re ok with that. I mean, LOOK at that caramel. Heaven. 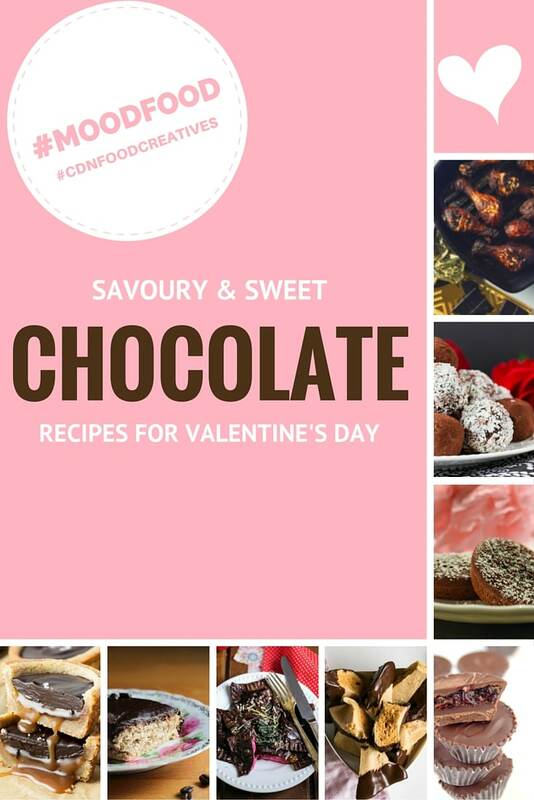 I’ve collaborated with a few Canadian blogger friends once again, and this time Charlene from Chew Street came up with a Chocolate theme for Valentine’s Day. 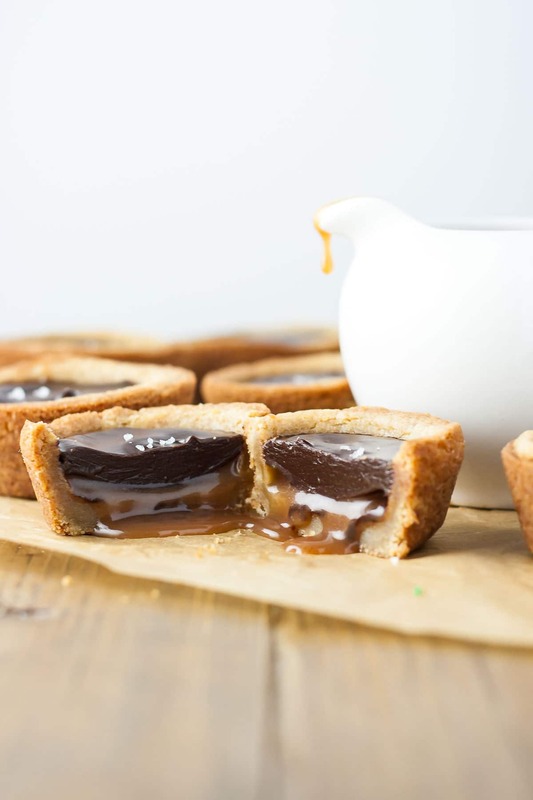 The idea for these Caramel Cookie Cups came to me from this pin which uses a clever two-pan method, but that’s not how I ended up making them. That WAS my plan, but I was worried the cookie dough would be too firm and wouldn’t bake/shape up properly. To make the cookie crust, I adapted my favourite chocolate chip cookie recipe minus the chocolate chips, used a large cookie scoop to portion it, and baked them up. I still baked them in a muffin tin, but then I used a the cap from my Pam for Baking cooking spray to press down into the cookies right after they came out of the oven. You could use any small jar or container as long as it’s smaller than the muffin tin cup size. You need to do this when the cookies are still HOT though, so be careful not to burn yourself. I made the caramel from scratch, but you could use store-bought as well. Caramel and I are not exactly friends. For some reason, I always struggled with it in pastry school. Then again, working with boiling sugar is not my favourite thing to do. I was stressing a bit about making it, but it was actually easier than I remembered, and every bit as delicious. The caramel sauce is a bit on the thinner side, even after chilling, so if you’d like it thicker just use a bit less cream in the recipe. You’ll need to refrigerate this before using it in the cups, so I recommend making it as the cookie dough is chilling. The chocolate ganache is incredibly simple to make. Chop some chocolate, boil some cream, and you’re done. It’s really important that you use good quality chocolate. I used Callebaut Dark Chocolate because it’s easily available to me. The dark chocolate worked well here, cutting against the sweetness of the caramel for the perfect overall balance. But you can use milk chocolate if you prefer. Whichever you choose, good quality chocolate really makes a big difference in both flavour and texture, so try to get the best you can. Typically I would let the ganache sit in the fridge overnight, but it would get too firm in this case. You just need to cool it to room temperature so it doesn’t soften the caramel when you pour it on. I used a measuring cup and a teaspoon to fill each of the cups, but you could use a piping bag if you prefer. I poured in some caramel, placed the cups in the freezer for 30mins, then topped with the chocolate ganache and some sea salt. How much caramel/chocolate you add in each cup is up to you! 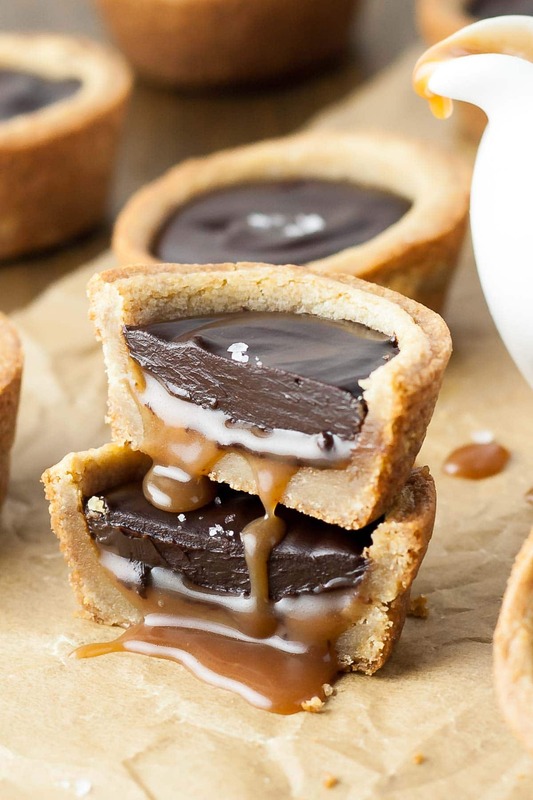 These Caramel Cookie Cups are ultra decadent and delicious. 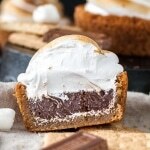 Plus, you can easily try different combinations of cookie, filling, and chocolate. I already have a few ideas on my radar. 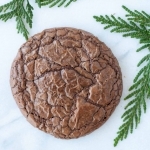 Be sure to check out the delicious Chocolate-themed recipes from my Canadian blogger friends after the recipe! You can use store-bought caramel if you prefer, though I would recommend Dulce de Leche since i find it a bit thicker. 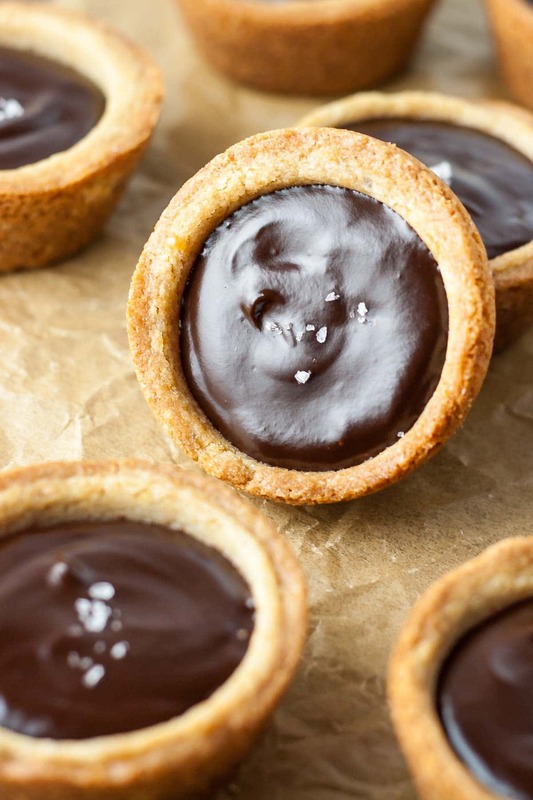 Ensure the ganache and caramel are completely cool before pouring them into the cups. Chill the cups once the caramel layer is in to firm them up. Preheat oven to 350°F. Spray 2 regular sized muffin tins with cooking spray. Beat butter and sugars on med-high until light and fluffy (approx. 2-3mins). Reduce speed and add eggs (one at a time), and vanilla. Beat until combined. Add flour mixture a little at a time and mix until just combined. Using a large cookie scoop (3 Tbsp) scoop dough into muffin tins, press down to flatten slightly. Bake for approx. 15mins or until browned and mostly set. Place sugar and water into a medium pot, stir to combine, but to not stir from this point forward. Cook over high heat, washing down the sides of the pot with a pastry brush dipped in water as needed to prevent crystals. Cook until desired color of caramel is reached and immediately remove from heat. Very slowly, add heavy cream. The mixture will bubble up (a lot) and boil. Add butter, return to heat, and bring back to a boil. Cook for 2 minutes stirring constantly. Using a measuring cup or a teaspoon, pour some of the thickened caramel into each cup. Place in freezer for 30mins to set. 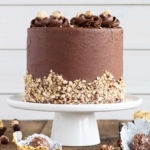 Remove from freezer and use the same method to top with ganache. Sprinkle with sea salt if desired and place in fridge to set. * I let mine sit in the fridge overnight. ** The ganache can sit on the counter overnight. Place plastic wrap directly onto ganache to prevent a skin from forming. 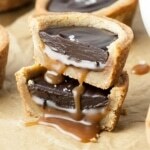 I really want to make these, but I am a little concerned about the caramel part. When you say cook until the desired color of caramel is reached, about how long do you think? Knowing me I would totally ruin it! Hi Madeline! It really depends on the stove! It can take around 10mins. I pretty much watch it like a hawk after a couple mins or so as it can quickly go from golden brown to burnt! 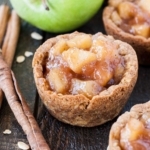 Could you make these in mini muffin tins instead? 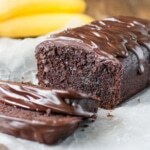 How would you adjust baking time if so? Hi Shannon! Yes, that should work fine. I haven’t tried myself, but i would start checking them at 7mins or so. Hi Davey, I don’t have measurements in ounces, but you can easily convert them on google. It would be really helpful if all the measurements were in imperial, like the cream and chocolate. Hi Frances! Strange that they only made 11 tarts — maybe your cookie scoop is bigger than mine! You could totally make a well before baking, but it would still puff up a bit and require *some* pressing down. I’m going to try that way next time. I’m glad you still liked them!! These are great gift ideas too! Thanks for sharing! Totally Pinned! Looks delicious… But I’m curious about that white layer in the photo that is not mentioned in the recipe.l at all. Hi Victoria, There is no white layer, that’s just the light reflecting off of the caramel. Looks great! Can I ask what the white layer is? Hi Sarah! There is no white layer, that’s just the light reflecting off of the caramel. Well these just look SO divine, oh my! 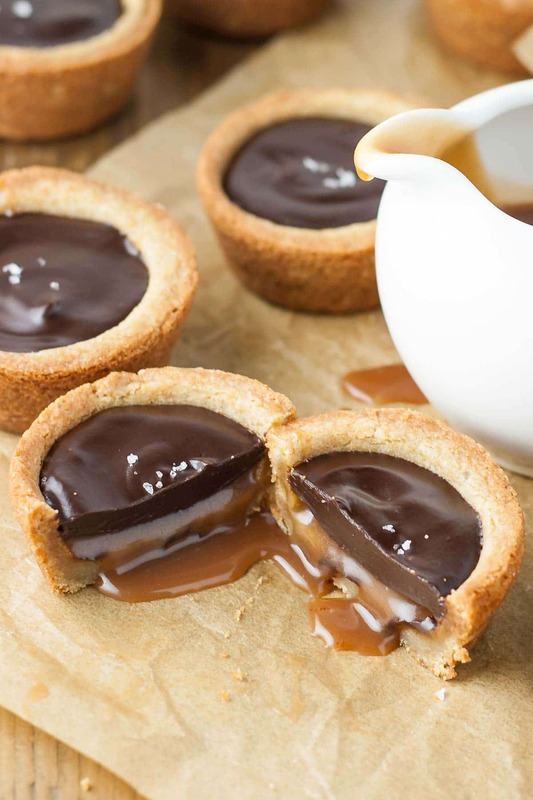 I adore everything about these gooey treats- the cookie cups, the chocolate, the caramel, I wouldn’t be trusted around a batch! Yum. Haha, it was so hard to eat just one. And I am with you on the gooey desserts! Yum. Gorgeous and so easy looking!! I am a sucker for dark chocolate and that little dusting of sea salt on top is perfect! I am going to be making these for my hubby for Valentine’s day, I just hop they look as good as yours! I’m seriously wondering if I have time tonight to make these. They look amazingly gooey and delicious. I love dark chocolate and caramel together; stuff my foodie dreams are made of. 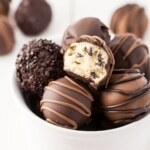 Dark choc and caramel is one of my faves too! It goes so well with the cookie. I hope you try these! Thanks Angela! They are pretty decadent for sure! Yes, yes, yes AND YES! Loving these Liv. Pinned! Olivia, you have outdone yourself! These cookie cups look unreal. I love caramel & chocolate together especially with sea salt! Delish.